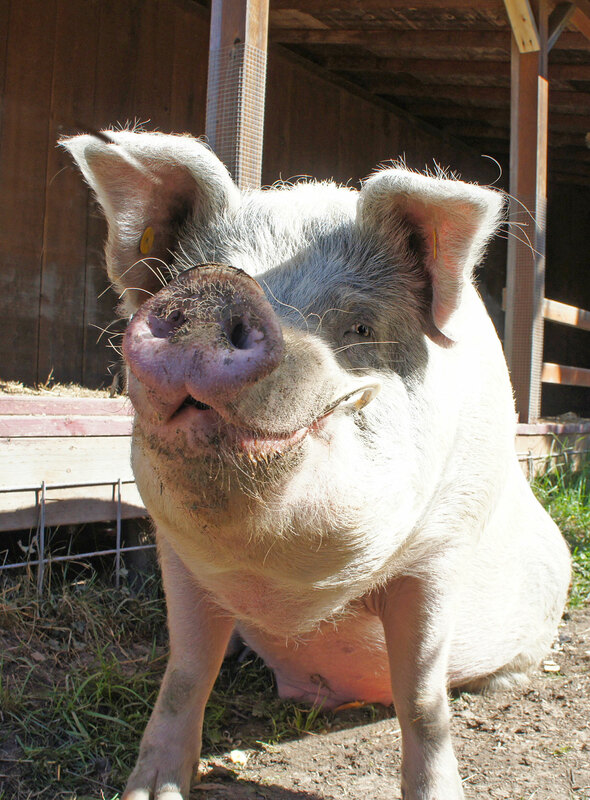 During April, 2013, Precious Life Animal Sanctuary received an email from a concerned mother whose daughter attended South Kitsap High School. She explained her daughter had participated in an FFA (Future Farmers of America) program to raise and care for a piglet that had been born with other litter mates eight months prior in September of 2012. The mother further explained a week prior to sending us the email, all the FFA students were informed that their pigs were to be taken to a Northwest Fair to be auctioned off for slaughter. 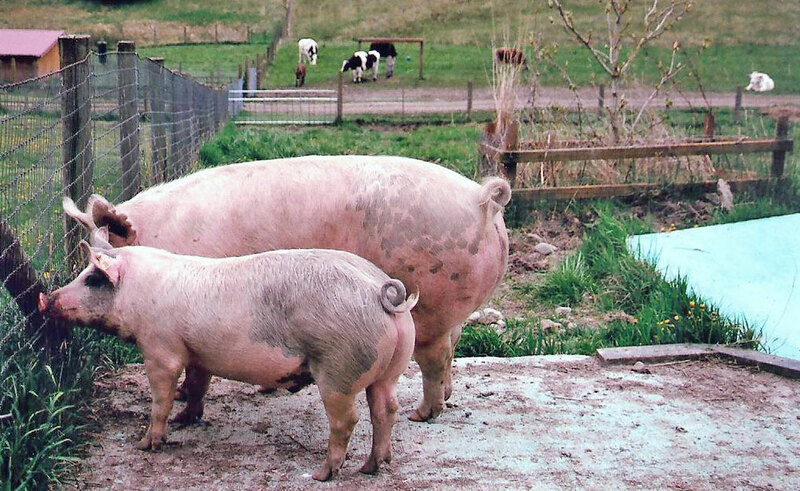 Her daughter was the one exception who refused to take her pig named “Oscar”. PLAS contacted the mother by phone and she said, the more she became involved, the more upset she became after viewing the pigs herself. According to the mother, the pigs were in overcrowded pens, constantly neglected and living in layers of their own excrement. The mother believed that most high school teenagers including her daughter had more pressing priorities during the week and on weekends than to clean up and care for litters of pigs. We asked to speak to the daughter who said Oscar was living alone outside next to the barn in close proximity to the high school. She said if a home could not be found for Oscar he would be slaughtered in a week. The mother said she had contacted the two largest farm sanctuaries in Western Washington and they had passed on him. We also informed both the mother and daughter we were not in a position to take on the responsibility, expense, and wear and tear of our own pig enclosure to accept an- other farm pig and would have to think it over. This was certainly a compelling case to take Oscar given the fact that only one young student in the entire class under incredible peer conformity to fit in and not be ostracized showed a sense of compassion to allow her pig life over death. This was the primary reason that influenced us to travel to the high school and investigate firsthand what we had been told. 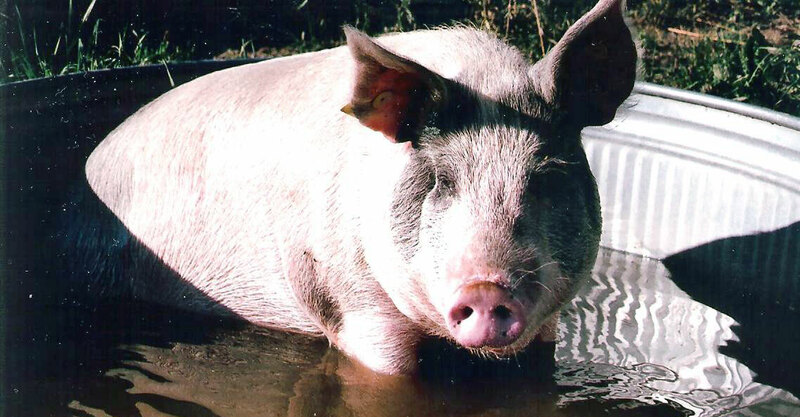 Oscar, who weighed around 120 lbs., was outside in a small fenced dirt enclosure that had been used over and over again for litters of pigs. The ground was totally wet mud with pools of water-filled ruts and almost non-existent housing to protect any pigs from the cold and wet spring rains. We entered the barn and saw different-aged pigs confined in overcrowded pens that, at the time, had been cleaned of their waste. We told the mother and daughter we would take Oscar and put him on a leash, but he refused to go up the ramp to our van. We said they would have to recruit other students to assist; otherwise, we couldn’t take him as we had no other means to transport him. The mother said they would try and fortunately the next day on Sunday, we returned with two of our own volunteers and managed with the help of students using ropes, pushing and shoving to get squealing Oscar into the van. When we arrived at the sanctuary and backed up to the pig enclosure, Oscar was reluctant to leave the van as he saw the immense size of Wilbur and Floppy. He finally overcame his fear, hoped for the best and hopped out next to his giant roommates. Oscar quickly adjusted to his wonderful new life and became inseparable with Wilbur who towers over him.